Brett Payne is a leading contemporary British silversmith; he is a Liveryman of The Worshipful Company of Goldsmiths’, a Fellow of The Institute of Professional Goldsmiths’ and past Chairman of The Goldsmiths’ Craft and Design Council. Brett Payne designs and hand makes original Sterling Silver Tableware and Candlesticks in his workshop in Sheffield, England. His approach to design and making synthesises an ancient technique; hot forging, with original and contemporary ideas of form. His belief in the importance of simplicity leads to a refreshingly direct and uncomplicated way of making that produces contemporary classics. The Britannia Silver Camping Set by Brett Payne exists to pose the question whether or not silver is relevant outside a traditional dining environment. It would sometimes seem that, like beauty, it has no place in a hostile environment, and yet some of the harshest landscapes on the planet are also the most beautiful. Is silver a mature enough material to be accepted as relevant outside the conventions of civilised domestic life? Can the parameters of its use be pushed beyond the standard cannon? The practical qualities of silver, its robustness, good heat conductivity and antimicrobial properties, suggest a far wider role for such an aesthetically pleasing material. The set comprises six separate vessels: a frying pan, a saucepan, a bowl, a drinking cup and an egg cup. The six parts can be packed inside one another and condensed into a single object. Fabricated in Britannia Silver, the camping set combines the techniques of hot forging and spinning to construct six contemporary forms that function both as stand-alone implements and as an ensemble. 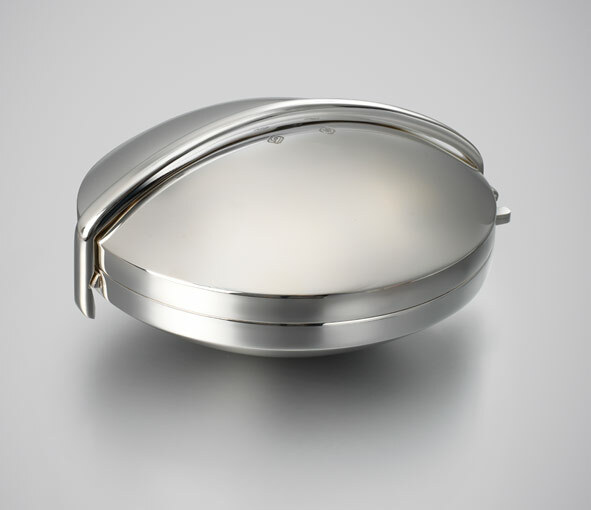 Brett Payne is a leading Contemporary British Silversmith; he is a Liveryman of The Worshipful Company of Goldsmiths, a Fellow of The Institute of Professional Goldsmiths and past Chairman of The Goldsmiths’ Craft and Design Council. Brett Payne designs and hand makes original Sterling Silver Tableware and Candlesticks in his workshop in Sheffield, England.